This is potentially a huge season for Indiana University baseball. 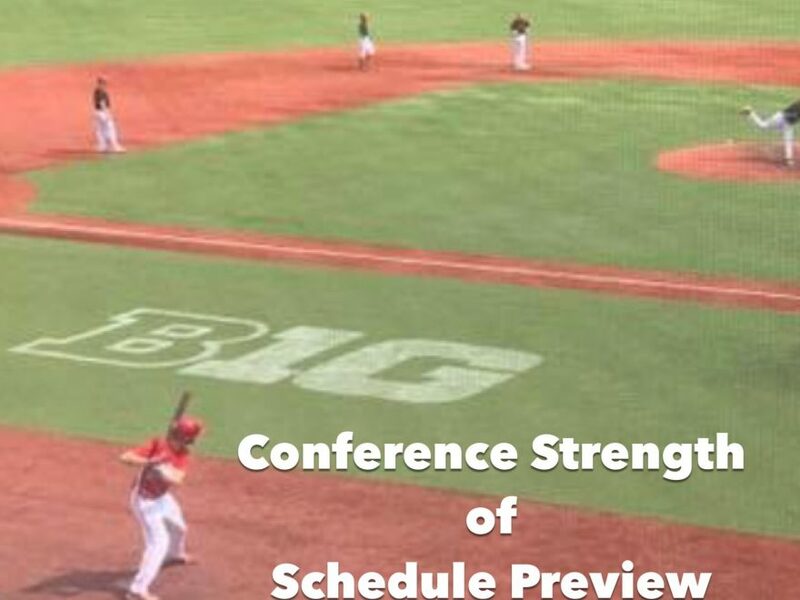 I have looked at the #iubase schedule as a whole already and showed how the team could get to 40 wins, the target I think will be needed for an at-large bid. This included the Hoosiers going 13-11 in the B1G. On the surface this seems weak for a 40-win season. When the Hoosiers got the #4 national seed in 2014 they had won 42 games including an incredible 21-3 record the B1G. So what is up with this? 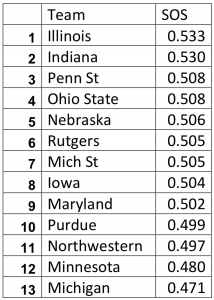 Most importantly the B1G is a much better conference overall with parity. Last season the Hoosiers had a good enough resume to get an at-large bid to the NCAA tournament despite only a 6th place finish in the B1G. Now keep in mind, that 6th place finish was only 2 games out of 1st place. That’s parity. Even still, if this is supposed to be the Hoosier’s year, why only a 13-11 predicted conference record? The answer: unbalanced scheduling. There are 9 weekends devoted to B1G series. All series are 3-games and due to Wisconsin not playing baseball, at least one team each week must play a non-conference series. This means with 12 other teams, each team will only play 8 out of 12 or 2/3rds of the league. **Note: IU has two games scheduled in 2018 with B1G opponents that do not count as conference games. A midweek at Purdue and a neutral site tourney game with Rutgers. Only the eight B1G scheduled series count for conference standings. To stress how messed up this was last season I generated a ranking based on RPI formula applied only to conference games. This also included the B1G Tournament. As you can see, despite a sixth place win %, Indiana finished with the second best conference RPI. In my opinion this makes conference standings a dubious thing to talk about, but it is still highly considered. I think it will matter in 2018 if the Hoosiers are serious about getting a top-16 seed and bringing an NCAA Regional to the Bart. It looks like #3 through #11 are pretty close to balanced, but top and bottom 2 have clear issues. I know that Chris Webb of Ten Innings (right after the MLB Draft) expected a battle between Indiana and Minnesota for the 2018 B1G Title. If that is the case, the 0.050 point SOS difference heavily favors Minnesota. 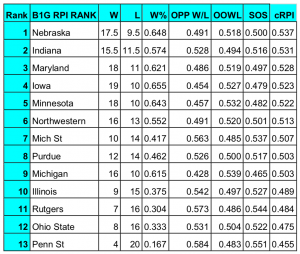 With the #2 RPI, Indiana finishes in 7th place. Minnesota bumps up to #1 with the #5 RPI. Given that they have all of the key pieces of their explosive offense back I think it is wishful thinking to say that Minnesota is not the prohibitive favorite at this point to win the B1G regular season title. 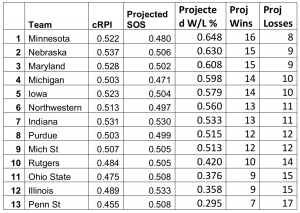 What I find very interesting is that this model predicts a 13-11 B1G finish for #iubase just like my original prediction looking at the series matchups one by one. How will the teams be different in 2018? Iowa and Michigan both lost a lot of key pieces. Almost everyone but Indiana has lost their Friday pitching starter from last season. I haven’t been able to pull up details, but I have to think Illinois and Ohio State will be better this season. Those programs are just too good to have two consecutive down years. Penn State and Rutgers may actually be worse from looking at who they lost. Nebraska lost one key piece and a Nebraska fan site was not impressed with the incoming recruiting class. If that is true it’s possible the balance in the schedule will be even worse than what is shown in this exercise. Indiana plays both Illinois and Ohio State, Minnesota only plays one of them. Minnesota plays both Rutgers and Penn State, the Hoosiers play neither. Making those adjustments could well see improved performance from Indiana, but this schedule handicaps the Hoosiers massively against the Gophers. They can’t just be better. They have to be a lot better in 2018 to win the regular season title. I will take another look at this in mid-March when we have a month of non-conference games to factor in how different these teams really are from 2017 to 2018.